Millions of girls in the world believe the clear skin is a myth. 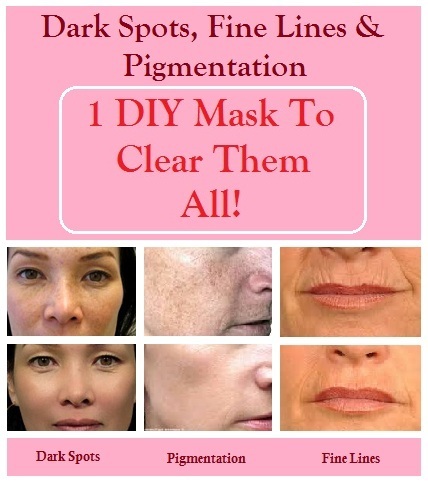 The old aged people are most concerned with these problems as they are getting tired of being treated for fine lines and dark spots. Those people should not work over medicines but they should see how they can find solution through the real and easily available ingredients at their home. One of the best things you can do is prepare your own DIY face mask that can effectively work on your skin. Some of the important ingredients that are useful for making face pack are turmeric, papaya, yogurt, aloe vera and almond oil. Now you will come to see how these ingredients do the magic. Turmeric covers about 300 types of antioxidants, which is able to repair, heal and promote regeneration of the new skin cells. Papaya has a special enzyme papain that removes the dead skin cells and reduces the inactive proteins and due to the high proportion of vitamin A in papaya, it works to lighten the dark spots and gives a lovely glow on the skin. Aloe vera is packed with the moisture which leads to hydrating the skin. Yogurt contains lactic acid which works like a mild bleaching agent. At last, almond oil is fully nourished with vitamin E, which helps in slowing down the ageing process. So after knowing the information about these ingredients, you will definitely understand the worth of this face pack. It is nothing less than a miracle to your skin. Here are the things you need to do. Step 1: Take 1 piece of ripe papaya, peel off its skin and remove its seeds. Cut into cubes and grind them for turning it into the pulp. Step 2: Extract the fresh aloe vera gel and add 1 tsp of it into a bowl along with a pinch of turmeric. Stir this mixture continuously with the help of the spoon until it becomes like a smooth paste. Step 3: Depending on your skin, you can take essential oils of your own choice or just 5 drops of almond oil. Make sure you do not use too many of oils as it will make your skin greasy. Step 4: Using the mild cleanser, cleanse your skin to remove the dust and dirt on your face. Pat dry with the soft towel then allow your skin to moist. Put on a head band and tie your hair up and then do the procedure. Step 5: Apply a thin layer of Ayurvedic mask to treat the fine lines and dark spots with the help of the brush or clean fingers to your face and neck. Step 6: Sit for about 30 minutes. Dip two cotton pads in a rose water and clean your eyes and get relax. Step 7: If you notice your skin is dried off before and it stretches, Wash your face and splash some cold water immediately. Scrub for a while in a circular motion to exfoliate the skin. Now rinse it off with lukewarm water. Dry off your skin and then apply a good moisturizer. You should use this face pack for once in a week. The results are good enough that you will get surprise from.